The Monster Workbench is a solid and straightforward offering. In the last few years, the common workbench has come under scrutiny and a bench like this tends to get a bad rap these days. So for me, it was refreshing to see a simple yet sturdy single-vise design with little in the way of bells or whistles. Kenney provides reasonable justification for his design and executes it in a way that really resonates with me. He clearly is a hybrid woodworker and takes the time to show some techniques using hand tools only as an alternative, making this project approachable for everyone. My only significant gripe with this production is the length. There are many subtle details and solutions to problems that inevitably arise when building a workbench. It would have been nice to see these issues addressed given the fact that there was plenty of room on the DVD, and in all likelihood the footage fell to the editing room floor. Judging from the reference to “episodes” in the script, I assume this production was originally intended for the FineWoodworking.com website and as we know, anything over 5 minutes is far too long for the average woodworker to sit through (dripping with sarcasm). Want to win a copy of this DVD? Simply leave a comment here or on this post in the forum. I agree about the need in the market to over deliver from promises. Stores do better that provide not just good price but unexpectedly good service, movie DVDs that don’t provide ‘additional material’ are not considered ‘premium entertainment’. You guys on your various shows provide not just the technical details but humor and a great entertainment flavor. All that said, even techie video’s are not expected to go above and beyond to be considered ‘good’. Great info. 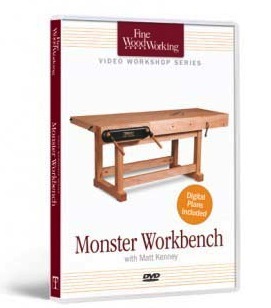 Your evaluation of monster workbench DVD is great. I am a intermediate woodworker and have been looking for a good workbench plan.